Cards are numbered 1 to 13. 7 are the least powerful card while the extreme numbers (1 and 13) are the most powerful. Keep in mind you can play on your opponent’s side (unless you are playing the designer’s version were you can only play on the other side only when your side is full). Before you play your first card, take a look at your hand and the colors on the board. If you have section that matches your cards, then go after it. Burn weak cards if the value doesn’t matter. In other words, if you only need a 7 to win, then use a 7 and not a 13. 13 would be over kill. 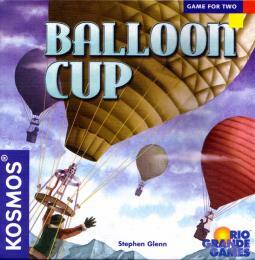 If you are going to “lose” a section in Balloon Cup and you have no other “good” move to make, then burn a weak number on that section, lose the section, but then draw another (hopefully good) card, and play again. You will get first crack at a new section. If you know for sure that you can not win a section then stop playing on the section. With the exception of the previous situation (cause a loss on a section to get a free card and turn), make your opponent earn the section by wasting moves. As soon as you know that you have “locked down” a section, meaning that your opponent can not win that section regardless of card play, play on another section. The objective is to be in control of as many sections as possible and make your opponent waste turns playing on sections they are going to loose. Check out this BGG get post on advance strategy for Balloon Cub. Joe Grundy does a nice job of laying out the card distribution as well as some deep discussion. Balloon Cub is an easy game that will pass evening hours with your family. So sit back and enjoy the Balloon ride.